In the past, counterfeiters produced false banknotes with printing presses, and some of the more skillful counterfeiters went to great lengths to imitate the original. Today, sophisticated computer printers and copiers enable even unskilled would-be counterfeiters to produce notes that bear at least a superficial resemblance to real ones. However, the federal government continually works to stay a step or more ahead of counterfeiters, updating currency and making it ever more difficult to duplicate. For virtually as long as there has been regular currency, there has also been false currency, which has provided a highly lucrative illegal trade to those who can successfully pass off false banknotes as the genuine article. The period since the middle of the twentieth century has seen two significant waves of counterfeiting. First, there was a surge in the illegal production of banknotes during the 1960s, when advances in printing and graphic arts technology enabled counterfeiters with the right equipment and skills to produce highly accurate copies of federal currency. By the 1990s, however, counterfeiting by means of the printing press had diminished in significance compared to a new variety of counterfeit currency manufacture, this one using computer printers. The phenomenon of "P-notes," or "printer notes," first came to the attention of law enforcement in the early 1990s. In 1995, authorities made a total of 37 arrests nationwide in connection with the production and distribution of currency produced on ink-jet or laser-jet printers. By 2000, this number had skyrocketed to 4,500 arrests, and officials estimated that P-notes accounted for as much as forty percent of the currency seized by the United States Secret Service (USSS) and other agencies annually. 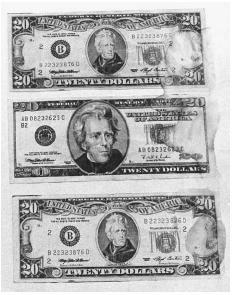 A computer printout of counterfeit $20 bills removed from the home of a Massachusetts teenager by the U. S. Secret Service. professional, highly trained practitioner who usually possessed, or at least had access to, printing equipment whose operation would require knowledge far beyond that of a novice. The 1990s variety of counterfeiter, by contrast, fit a quite different profile. Rather than being "professional counterfeiters," they were more likely to be drug dealers who used their P-notes in connection with other crimes, most notably the purchase of drugs. Typically youthful (many were juveniles), these new counterfeiters lacked skills for counterfeiting. Whereas the old model at least required some degree of human ingenuity, the new type of counterfeiting was primarily a matter of possessing the right equipment. Equipment loomed large in the old counterfeiting technology as well, but practitioners had to know how to use it. Counterfeiters of that era carefully studied currency, and made numerous photographs of it with graphic-arts cameras using different filters so as to break down the various stages of the printing process. Only after considerable trial and error could a workable set of printing plates be produced. In contrast to this painstaking process, the new counterfeiting process required only that one use a high-quality scanner to obtain an image of a bill, then print that bill on a printer with high resolution. Given the ease of production, counterfeiting again became a growth industry during the 1990s, and in 2001, the federal government seized a record $47 million in counterfeit currency. By the following year, the figure had dropped to $43 million. The fact that the value of counterfeit currency seized in 2002 had dropped by almost 10 percent is not an indication of looser standards in interdiction; rather, after the September 11, 2001, terrorist attacks on the United States, the federal government was more likely to be aggressive in searching for counterfeiters, whose ranks could presumably include foreign operatives funding illegal operations while undermining the value of U.S. currency. The reduction in seizures is probably an indication of success in efforts by the federal government to make its currency more difficult to duplicate. In 1996, partly as a response to the proliferation of P-bills, the U.S. currency underwent its first major redesign in 70 years. Already difficult to duplicate, the currency became much more so thanks to measures such as the use of optically variable ink (OVI). The latter contains tiny particles of special film such that it changes color depending on the angle from which it is viewed. Extremely expensive and therefore used in limited quantities, OVI is just one of several specialized varieties of ink used in producing currency. By 2004, additional changes included the introduction of new colors of inks. None is commercially available—another hurdle in the production of false currency. A number of other features distinguish genuine currency from counterfeit. One of the most obvious ones is the paper itself. Every variety of national currency is made with a special type of paper (the Australian dollar is actually printed on very thin plastic), and U.S. currency uses a highly durable variety made from cotton pulp. Not only does it have a distinctive texture, it is far more resistant to tearing, deformation, moisture, or sunlight than most varieties of paper. Again, currency paper is not commercially available. For the counterfeiter, a genuine banknote is a veritable minefield of potential pitfalls, and literally every square millimeter presents its own challenges. There are watermarks, embedded threads, see-through features, microprinting, holograms, latent images—even forms of embossing to facilitate recognition of various denominations by the blind and visually impaired. The printing of currency is also highly complicated, involving various processes at different stages. In addition to lithography, letterpress, and sometimes silkscreening, there is intaglio, an extremely expensive, technically difficult process in which the surface of the paper is deformed ever so slightly—another distinctive feature of official currency production. Special safeguards against copiers. Aside from these challenges to the would-be counterfeiter, there is also the problem of producing a usable serial number. Given these challenges, a drug dealer with a computer printer or copier is unlikely to enjoy long-term success in this illicit trade. For those using a copier, the problem is rendered even greater by additional measures. Most modern forms of currency have anti-copy features, tiny designs that have words such as VOID or FAKE embedded in them in such a way that they will be visible if copied. Manufacturers of color copy machines have also implemented a number of measures to circumvent the use of their equipment for illegal purposes. Most modern copy machines carry and embed unique codes, invisible in ordinary light, such that their products are traceable to a specific machine. There is also technology that detects specific design elements of currency, and will cause the copier to shut down if it is used for illegal purposes. Optical Document Security. Boston: Artech House, 1998. Sincerbox, Glenn T. Counterfeit Deterrent Features for the Next-Generation Currency Design. Washington, D.C.: National Academy Press, 1993. U.S. Currency: Treasury's Plan to Study Genuine and Counterfeit U.S. Currency Abroad: Report to Congressional Requesters. Washington, D.C.: General Accounting Office, 1997. "Counterfeit Detection: A Guide to Spotting Counterfeit Currency." < http://www.indigoimage.com/ > (February 5, 2003). "Technology Breeds New Counterfeiting." ABC News < http://abcnews.go.com/sections/Downtown/2020/Downtown_010601_counterfeit oney_feature.html > (February 5, 2003).